There are very few rappers who are as adept as Aesop Rock at creating such inventive rhymes, spontaneously and with sparse beat production. 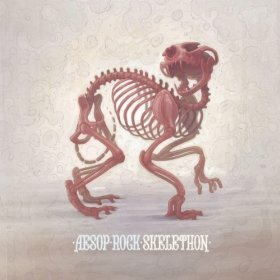 Because of the stream of conscious quality of the rhymes of Aesop Rock, it can be hard to get a clear meaning of what exactly is going on in an Aesop Rock record. Skelethon seems to be about a lot of things, and at 1 hour and 5 minutes, there are a lot of images to deal with. It’s too easy though to dismiss Skelethon as merely mood music to space out to. There are rich stories in each song. “ZZZ Top” is probably about an outsider attempting to fit in, but not trying that hard because they’re just too deep into kung fu fanaticism with the constant classic hard rock songs playing in their head. “Somebody in a cultivated moment of distress/Composed himself enough to carve ‘Zoso’ in this desk,” in reference to the Led Zeppelin symbol. Skelethon is loaded with imagery that bespeaks of a shut-in frantically writing every single thought down so that whoever finds his decaying body might be able to decipher just what went wrong. “Crows 1” has a simplistic, feminine, childish voice rhyming off-beat about resisting the influence of making music that’s expected. There’s an underlying message of what Aesop Rock thinks about “mainstream” music, and it’s bigger than just selling out. Skelethon has no respect for music that’s obvious or shallow. The bottom line: Skelethon is an underground hip hop album with minimal beats and Aesop Rock spewing his thoughts over every single song. It’s convoluted but refreshing with what slim pickings hip hop has to offer at the moment.